When you hear a neighbor say “South Poll” an image of icy Antarctica, not a red bovine, comes to mind. 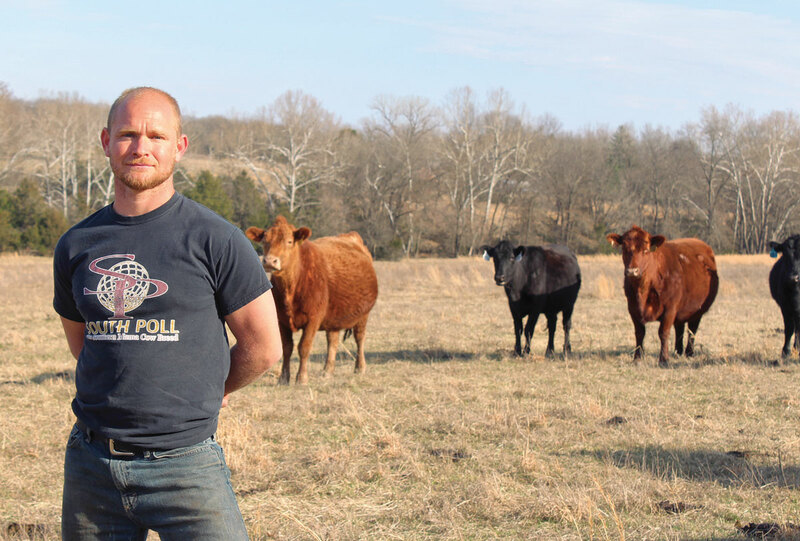 Ian Diamond introduced the South Poll breed to Stockton, Mo., four years ago to meet the needs of his existing operation. 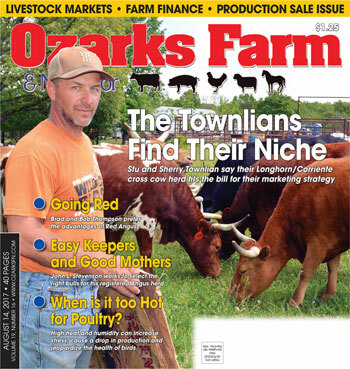 Ian started his cattle operation in 2012 with a group of Red Angus cows. “They didn’t fit. They fell apart when I grazed them through the winter in year-round forage based system. They were not parasite resistant,” Ian explained. The dynamics of his herd started changing with the purchase of one bull and five yearling heifers. Now, he manages 63 cows and 25 heifers through a partnership and contract grazing. He personally owns 20 head. The South Poll breed is a four-way composite between a Red Angus/Senepol and a Barzona/Hereford. Teddy Gentry, a member of the band Alabama, developed this Bos Taurus cross on his ranch in Alabama. He wanted a productive cow that would handle the heat and humidity of the South. The South Polls are short haired, slick, heat tolerant and docile. Their small to moderate frame allows producers to run more head per acre. Ian’s cows average 1,000 pounds, bulls 1,500 pounds and his weaned calves average 500 pounds. “I find them to be well-adapted to our area. I believe the South Poll is the only fescue-adapted breed. 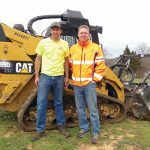 Since fescue is our primary grass here, they fit our environment,” Ian said. Ian manages his cattle from an organic standpoint. He does not vaccinate or de-worm, nor does he have to. His cattle have proved to maintain their health and condition without either. “My goal in running cattle is to be as natural as possible and not use a lot of feed and inputs,” Ian explained. Ian starts calving in late April and prefers a 60-day calving season. His natural approach extends to synchronizing the reproductive cycle of his cows with nature. 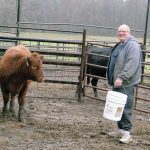 “I like my cows to calve with the largest wild ruminant animal in the area,” he said. Ian rotationally grazes his cattle at a rate of one cow per 3 acres. He does not overseed or replant grasses or legumes. “That is what I love about the South Poll breed, they are adapted to what we have so we don’t have to replant,” he said. He has seen an increase of desirable plant varieties and more grass per acre since he has implemented rotational grazing. Ian retains his heifers to build his herd. 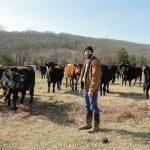 Most of his steers are sold as freezer beef locally in Missouri and in Denver, Colo.
“I direct market to customers, grass-fed, all-natural beef. 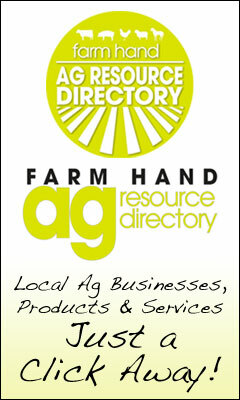 I am not certified organic because I operate on rented ground. I am working toward certification,” he said. He promotes his business though his Facebook page, New Eden Farms, but many of his customers are from word-of-mouth recommendations. “We are on grass so it takes a little longer, but I generally finish a steer at 2 years of age. My average hanging weight is 550 pounds,” he explained. In the future, Ian plans to sell registered South Poll breeding stock. “Our focus isn’t on growing the biggest and the best calf. It’s more about doing it with what we have,” he remarked. Ian and his wife Hayley have two kids, Israel (3) and Esther (1). They also own 40 head of Kiko meat goats. In addition to farming, Ian owns his own construction company, Double Diamond Builders, where he specializes in framing houses.